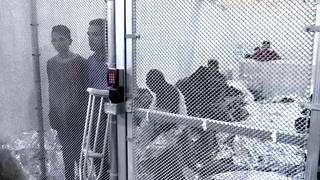 Concentration Camps in the U.S.: Andrea Pitzer Decries Tent Cities for Detaining Kids Without Trial | Democracy Now! "History Lesson: Gitmo Started as a Detention Camp for Immigrants"
Has the Trump administration set up concentration camps in Texas for migrants? The answer is yes, according to at least one expert: Andrea Pitzer, the author of “One Long Night: A Global History of Concentration Camps.” In one of her latest articles, Pitzer writes, “While writing a book on camp history, I defined concentration camps as the mass detention of civilians without trial, usually on the basis of race, religion, national origin, citizenship, or political party, rather than anything a given individual has done. By this definition, the new child camp established in Tornillo, Texas, is a concentration camp.” We speak with Andrea Pitzer in Washington, D.C. In another article, Andrea Pitzer looks at how Guantánamo started as a detention camp for immigrants. Andrea Pitzer joins us now from Washington, D.C.
Andrea, welcome back to Democracy Now! So, that is your latest headline for The Daily Beast: “History Lesson: Gitmo Started as a Detention Camp for Immigrants.” Explain. ANDREA PITZER: Basically, in the early 1990s, there were waves—tens of thousands of people in all—of refugees from Haiti and from Cuba that were heading toward Florida. And the U.S. did not want to let them touch down, which would make their asylum claims much stronger. They didn’t want to let them touch down on U.S. soil, so they interdicted them and held them at the naval base that had already been there for a very long time at that point. But they created a detention site to hold them. And so, you had this argument, that happened on a policy and court level, over whether they could be forcibly repatriated. Would that be in line with international treaties? Meanwhile, they were detained for a very long time. And you ended up with rioting. You ended up with guards being investigated for abuses. You had the most problematic prisoners being detained at Camp X-Ray, a chain-link-fence-caged area. And eventually, after several court battles, it was decided that there was not standing, that they, in fact—the courts couldn’t rule that this was U.S. soil, and that the claim wouldn’t be heard. But then there was another court case where, because of HIV detainees—HIV-positive detainees who were being held in isolation, without access to legal or medical care, a court agreed that they would hear that case. And as soon as the court agreed that they would hear that case, at that point it was the Clinton administration settled and made an agreement that would allow a certain number of people into the U.S. on certain categories. And that was, in part, to keep the courts from having jurisdiction at Guantánamo. And what’s interesting is this—from this original basis of it being a site for detention, indefinite detention, of refugees, that was a big part of the basis for why it was chosen after 9/11 to house terror suspects, because there was this idea that the U.S. courts wouldn’t be able to intervene, because they wouldn’t have the standing to do so. NERMEEN SHAIKH: Well, you write in your piece, in the same Daily Beast piece, quote, “The longer the detention and the more secret or hidden the facilities, the worse the possibilities for what can happen.” So, talk about what you write about in your book and what you’ve seen happen to detention camps, apart from Guantánamo, and how they’ve come, in your view, to resemble concentration camps. ANDREA PITZER: Well, this is my worry about the camps at the border. We have this policy, which, we just heard earlier on this show today, you know, was in place and being used in some ways before it was even formally announced. We’re hearing that they’re going to be moving some of these detention sites onto military bases, where we’ll have less access, we’ll know less what’s going on. And this goes back to a number of different camps that we’ve seen in the past. One of the most—one of the saddest examples was in France in the late 1930s. When the Spanish Republicans were losing to Franco in the Spanish Civil War, hundreds of thousands of them came across the border into France. And France wanted to keep them away from their main cities, so they built these pretty shoddy refugee camps. And they definitely started as refugee camps. But then, when Hitler started World War II, they began shoving enemy aliens, so Germans who had fled Germany. Some of them were Nazis and Nazi sympathizers, but mostly they were Jewish refugees. So these communities were shoved together in these same camps. They evolved into these enemy alien camps. And conditions were awful there. People committed—you know, considered committing suicide. Children died in them. And then, once France fell to the Nazis, the Nazis then actually took the Jews who had been held in these camps, that hadn’t escaped in the meantime, and they were deported to Auschwitz. AMY GOODMAN: Explain that, Andrea. ANDREA PITZER: Well, there’s a new office being formed, and they’ve already started doing it with some of these cases, in which they’re going to revisit naturalized citizens’ applications and review them for whether they were misrepresenting certain things, whether they committed small crimes a decade or more ago, that would technically allow that to be stripped. But it’s just—the overall approach of stripping citizenship is something that we see. When we see this kind of irregular detention growing, often it’s accompanied, in governments that go quite badly, that do bad things to their citizenry and to outsiders—it’s accompanied by this wish to strip citizenship from people that you think don’t deserve it. The most famous example, of course, is Nazi Germany stripping all German Jews of citizenship. But there are other examples. And I think this targeting that we’ve seen again and again through the rhetoric of “animals” and “rapists,” that we see at the highest levels, combined with these policy efforts, and then, last week, as well, with this decision by the Supreme Court on the U.S. travel ban, that the administration tried and tried and tried again until it could sort of pass muster—and that decision from Roberts last week said that the forcible relocation of U.S. citizens to concentration camps solely and explicitly on the basis of race is objectively unlawful. But a lot of scholars said right away, “First of all, this is just limiting it to U.S. citizens, so does that OK concentration camps for other people?” And then, also, the original Korematsu case from World War II, when Japanese Americans were interned, it was done on just the same basis. The judges argued at the time it was not solely because of race. But in retrospect, of course, it was obvious that it was. And so, now the court, even while sort of seeming to set aside the ability to create those kinds of camps, has provided the administration a fig leaf to say, “If you suggest it’s on any other terms, we’ll defer to your authority.” So, the courts deferring to the executive, the stripping of citizenship, this kind of growing new irregular detention that’s being done punitively—you know, we’re still a democracy, we still have a lot of ways to take action, but I think that it’s very problematic, moving forward. This is the kind of stuff we see where you end up with concentration camp regimes. AMY GOODMAN: Andrea Pitzer, you mentioned Fred Korematsu, who was the Japanese American challenging the detention of Japanese Americans in World War II, over 110,000 Japanese Americans in this country. Later, the government would apologize. Well, last month, Federal Judge Dana Sabraw, in San Diego, ruled all children under the age of 5 must be reunited with their parents within 14 days—Tuesday is the deadline for that—and all children above 5 must be reunited with their parents within 30 days, so the government has two more weeks for that. We’re talking about over 2,000 children. Now, interestingly, in an interview with the North County Times in 2003—and this is out of The San Diego Tribune—Judge Dana Sabraw said his experience as a Japanese American shaped him. He said, quote, “In light of that experience, I was raised with a great awareness of prejudice. No doubt, there were times when I was growing up that I felt different, and hurtful things occurred because of my race.” Judge Dana Sabraw is a Japanese American; his mother was Japanese. Andrea, talk about the detention of Japanese Americans in this country. ANDREA PITZER: Well, I think it’s a story that people think they know, but they don’t actually know. And it’s really relevant today. You know, there was between 110,000 and 120,000 Japanese and Japanese-American people who were detained after Pearl Harbor, and a lot of people think that it was done out of sort of this fear reaction to this horrific attack. But in reality, there was a government analysis by one of their top intelligence people at the time that very intelligently analyzed that it would be useless to detain this group, that it was already known that about 300 people or so that were actually dangerous, they could be rounded up, that it might do much, much more harm and create a kind of backlash to actually detain these citizens. This was all known. And this—and, in fact, Hoover, who does not exactly have a great civil rights record, J. Edgar Hoover, at the time, in World War II, did not think that mass detention was the answer. So there were many people in the White House, in the administration, in the military, who knew that this was a useless thing. It became part of a political objective. It got swept up in just the kind of rhetoric that we’re seeing today, where people got political advantage and power from damaging and doing great harm to a vulnerable minority in the country. And what’s interesting is that this information—these intelligence reports were actually concealed by the U.S. solicitor general. When that Korematsu case went before the Supreme Court, that information was suppressed, and it was not introduced. And I think that anyone who looks at this administration today and thinks that it would be more likely to turn over that kind of information in these kind of court debates—you know, I’d be very skeptical that they would be even more forthcoming today. And so, whether the justices would even get the full picture of what’s going on, if something similar were to come back, I think, is a real question, as well. NERMEEN SHAIKH: Well, Andrea, do you think that the term “concentration camp” is appropriate in this context? Because most people’s association with that term is in fact with extermination camps like Auschwitz and Treblinka during the Second World War. ANDREA PITZER: I think that we need to sort of recapture this word “concentration camp.” It should be that Auschwitz is the first thing that people think of, Auschwitz and the death camps, when they hear the term, because it’s the most horrific industrialized version. I mean, it created this genocide that killed millions. So, it should be the first thing we think of. But people forget that Auschwitz, before it was a death camp, was also just another camp that was part of the regular Konzentrationslager system in Germany. And that system existed for several years before it evolved and changed and grew into a horrific killing machine. And there were also almost four decades of concentration camps, things that were called concentration camps—civilian detention on the basis of identity—that happened before that. And so we need to keep in mind: How do you get from regular democracy and regular life into something like the death camps? And the truth is, it takes several years of propaganda, of manipulation of the public, of bending the courts, of weakening legislatures. And so, it’s those warning signs and those pre-emptive things we should be thinking about, rather than just that Auschwitz becomes then some island of isolation that came out of nowhere, because that’s not how it happened. I think we need to reclaim this term “concentration camp” for this kind of irregular detention of civilians without trial. AMY GOODMAN: Andrea Pitzer, we want to thank you so much for being with us, journalist and author of One Long Night: A Global History of Concentration Camps. We’ll link to your piece “History Lesson: Gitmo Started as a Detention Camp for Immigrants” [link] and “Why the Tent City for Children Is a Concentration Camp” [link].